Today, sewing machines and sergers can both take the same needles, which makes sewing easier. However many companies that make sergers opt for designing their own needles or using special style needles. In the package, serger needles are easy to identify, but when dropped into a sewing box they become impossible to distinguish with the naked eye unless they are unique in shape, like the ultra curved ones. Identifying these lost needles requires a bit of patience and a magnifying glass. Feel for a groove on the needle using your fingertips. Universal sewing needles have smooth shafts, while serger needles may have one short groove on the front, or one on the back and one on the front. If you can't feel for one, use the magnifying glass to look for a short groove above or around the eye of the needle. Locate the unique numbers on the shank (the thick part at the very top of the needle) of the needle using the magnifying glass. 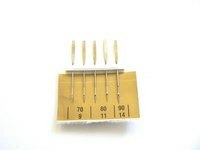 Numbers on a serger needle are usually separated by a slash mark ("/"). For example, the needle could be numbered "11/75." A universal sewing needle may be marked with single size numbers, such as 11, 14, 16 etc. Look to see if the name of the company that made the needle is stamped on the shank. Look for company names like "Organ" (the leader in serger-only needles), "Elna," "Janome," "Pfaff," "Bernina" (serger machine manufacturers) etc. on the shanks. The word "serger" may also be present. A universal sewing needle may have "Singer" or "Schmentz" stamped on the shank next to the size marking. After you have identified the type of needle, use the permanent marker to color the serger needle shank. Keep your needles separate if you can.